A classic motif that never goes out of style, the grape design will add distinction to any room in your home. Suited to a wide variety of applications, corbels will add aesthetic value however you choose to use them. To dress up the bottom edge of a window area please consider utilizing a window sill. The purposes are two fold: To create a larger relief area and extend the window frame for other decorative accoutrements such as plants, small statues, or trinkets; and secondly to ensure that no drafts or water can make it's way into your residence. This centrepiece is installed in the middle of long straight runs on the underside of the porch ceiling. It helps to break up these sharp lines when creating a Victorian style porch design. PVC construction ensures years of trouble free maintenance. 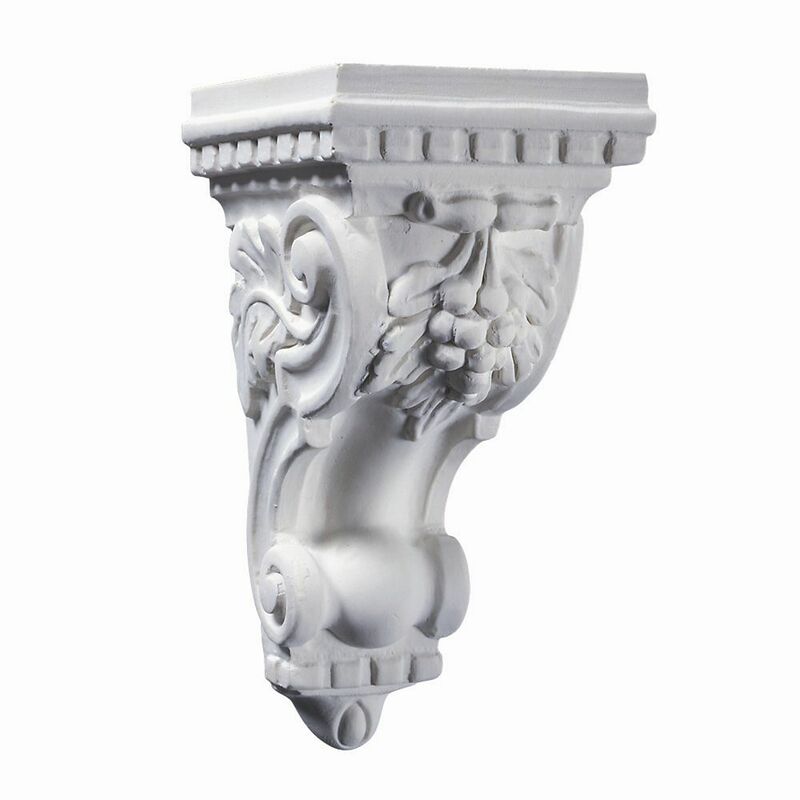 Unfinished Polyester Resin Grape Corbel - 5-1/16 Inches x 5-11/16 Inches x 9-13/16 Inches A classic motif that never goes out of style, the grape design will add distinction to any room in your home. Suited to a wide variety of applications, corbels will add aesthetic value however you choose to use them. Unfinished Polyester Resin Grape Corbel - 5-1/16 Inches x 5-11/16 Inches x 9-13/16 Inches is rated 4.0 out of 5 by 4. Rated 5 out of 5 by Jo from The corbels were not quality finish but was able to... The corbels were not quality finish but was able to paint them and they look great. Rated 2 out of 5 by James from two were all broken in transit and the third one... two were all broken in transit and the third one bruised. Had to return all three. The design was good but, the material was suitable for my use. The same design in a wood or a more durable material would be more suitable if the price was far less than currently priced. Rated 5 out of 5 by BettyLou from Great Corbel Sturdy material, made well with detail. Looks great on the wall. Good value for the price. Rated 4 out of 5 by Slim from Good product These seem to be marketed for single unit use. I went outside the box a bit and am usong them as a shelf support. I dont believe this is stated as a use on the website, but wanted to disclaim this. At any rate, they are lightweight, about 2 lbs each. They come with 2" screws and sheetrock anchors. I am not a fan of sheetorck screw in anchors, so I bought some toggle type and feel co fortable with them. But just be aware that the keyhole nslots seem to be imperfect. It can be tricky if trying to level them. I have 5 supporting 124" of shelving. I mounted one as my starting piint and rhen checked the others on that screw measuring it off the cieling. 2 of them werent perfectly milled in the keyhole, but 3 of them were dead on. I just measured off the cieling what the other 2 were off, 1/8 of an inch, so I adjusted their screws for that and they are perfectly level. Not a complaint, just a tip. Dont skip these. Oil based paint make them look beautifully old world. I love their uniqueness.